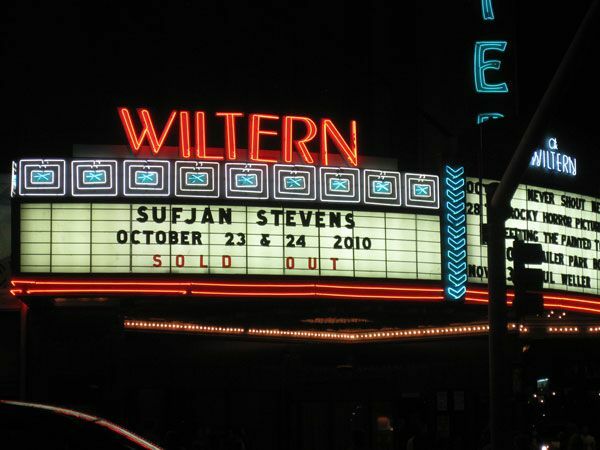 I’d been looking forward to seeing Sufjan Stevens for quite some time. Many years in fact, since after 2005’s Illinois he nearly gave up live performing – or at least touring. To my surprise the standing room only section at the Wiltern was filled with folding chairs. Apparently someone had predetermined that this audience didn’t stand up, and they were right. The only time anyone stood up was before Sufjan came back for the first (and only) encore. If I’d have known that I wouldn’t have purposefully picked loge seating. 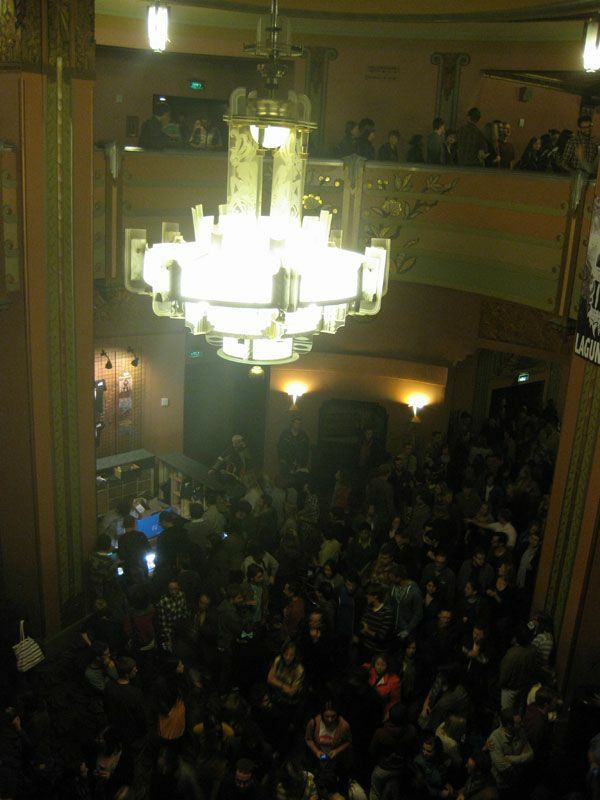 Every other concert I’ve attended at the wiltern in the lower section has been a disaster; people pack in like sardines and there is always some jerk pushing people around, forcing thyself in front of you, or just plain seven feet tall blocking your view. I decided after seeing Mogwai a few years ago that I’d always buy Loge seats from then on. So – of course, at this show, everyone downstairs is sitting nice and polite like. There wasn’t an official opening act. 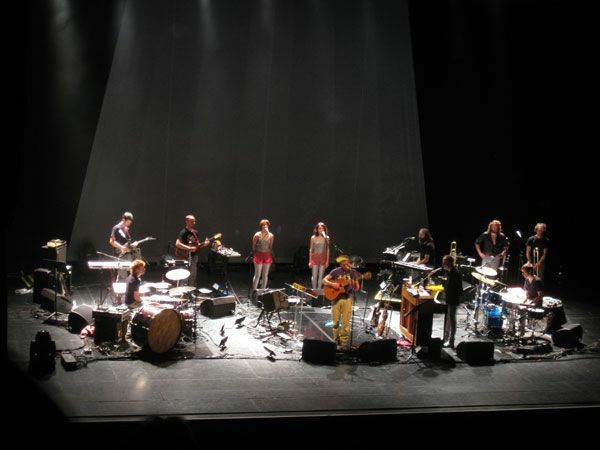 The internet had reported that a band would open, but instead Sufjan’s pianist and friend DM Stith played four songs. DM Stith is just one guy and a guitar. 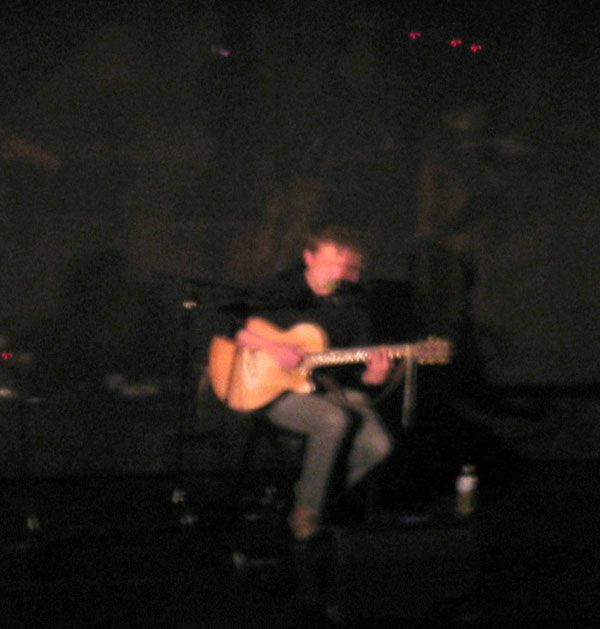 It reminded me a lot of Glen Hansard’s busking act. He then proceeded to play 75% of his new album Age of Adz. Some of this sounded much better with live instrumentation (Sufjan experimented with beatboxes and electronica on this album), especially the ending of the title track. Sufjan would later explain, in an EIGHT MINUTE SPEECH before Get Real Get Right, that the entire album, and the imagery used were based on the life and art of Royal Robinson. 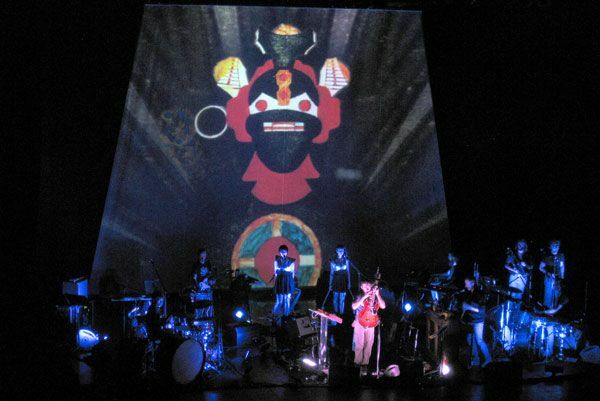 Many songs (mostly those from Age of Adz) featured fantastical animated spaceship/planet/monsters imagery projected on a giant screen behind the performers. 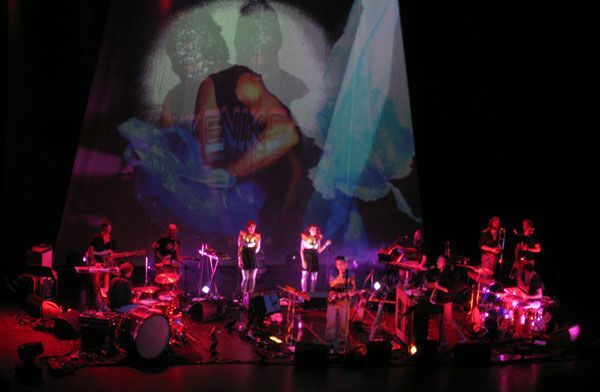 The ending of Age of Adz in particular, with a descent through a long winding staircase in space reminded me of the ending of the live interpretation of Lateralus on Tool’s 2001 tour. Below is a shot from the beginning of Age of Adz showing Royal’s painting (and album cover) on the big screen. 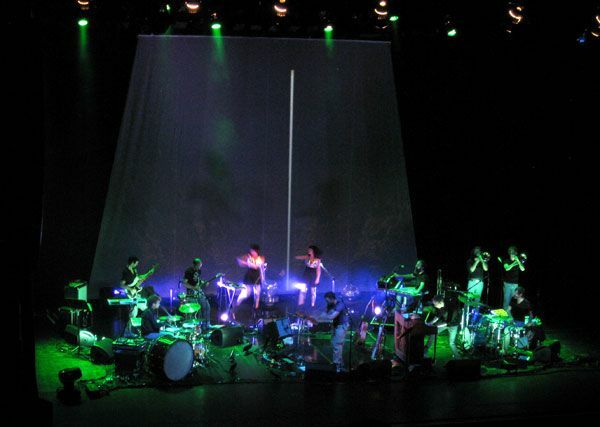 I wasn’t able to capture it in a photograph, but during many songs a veil of thin material came down over the band. This had two purposes. 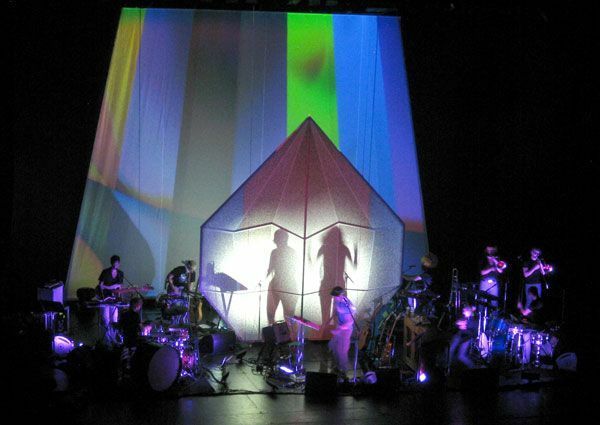 #1 It made the band look fuzzy like a photo from an old camera (or a new camera with Vaseline on the lens) #2 The fabric was actually a thin projector screen, and once in place crazy visuals were broadcast in front of the band, like on the song Vesuvius lava bubbled up until eventually rising above the band. 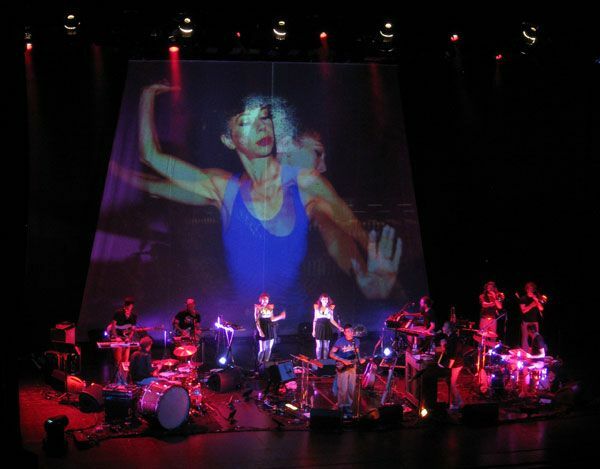 The screen was opaque though – so lots of light and visuals still came through from behind with spotlights circling and flashing silhouettes of the band on both screens from time to time. Towards the end of the night Sufjan announced that we’d better get ready for a long 25 minute journey (or something like that). I groaned. This meant we were going to be treated to the new song Impossible Soul, which takes basically one melody and tries to play it in as many genres as possible. Now this wouldn’t be too bad, except for the fact that after the first ten minutes one of the genres was rap. This hip hop element was no surprise at this point in the show though. 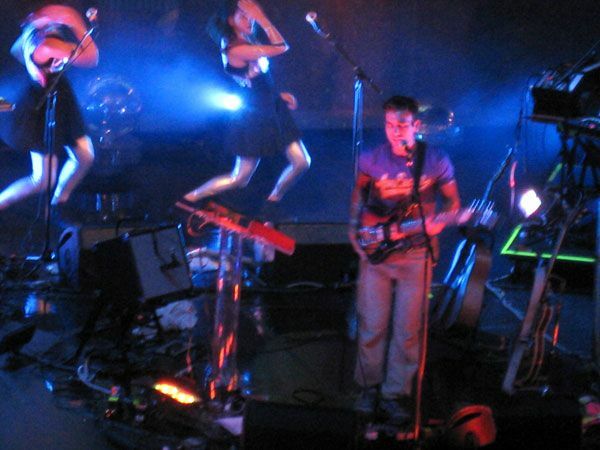 A few earlier songs from Age of Adz had embraced a hip-hop aesthetic, with Sufjan and his crew donning various paraphernalia and dancing appropriately. The “funk” portion of Impossible Soul was particularly egregious though as, to my surprise, Sufjan dashed artistic credibility to the wind and turned on Auto Tune. Yes, Sufjan Stevens, the guy who wrote whole albums about states in the union, and writes melodies on the banjo…. used autotune. Why? I have no idea. But I certainly feel “becked.” In 2002 Beck released Sea Change. That album was his best album, devoid of any electronic influence, a stripped down almost “country” album. It didn’t sell well (of course), but critics united in it’s praise. So, I was determined to catch Beck the next time he was in town (Columbus at the time). Soon, tour dates were released including the Wexner Center. To my dismay he played almost the entire album Midnight Vultures, complete with a crew dressed up in 70s bellbottoms and fros with psychedelic/disco visuals. I was horrified and felt betrayed. I had come to see him perform the only Beck album that rolling stone gave a five star review to – and I got “Sexx Laws” instead. Sufjan’s embracing of hip hop felt a little weird – but autotune crossed the line – and by the way – Sufjan, you’re a little late to the party. It was LAST SUMMER that a rapper already released a song called Death of Auto Tune. At one point Sufjan ran to the front of the stage with his dancers and started break dancing (or something, I’m not up on hip-hop dance moves). To assuage the older fans like me, the next song was Chicago, which somehow felt a little forced. Then it was off to the dressing room before an encore. The encore was a little strange. The songs were all done with little instrumentation. It started with Sufjan by himself on stage standing at the piano playing Concerning the UFO Sighting Near Highland, Illinois. After that was an acoustic version of Casimir Pulaski Day, then a four man banjo group version of That Dress Looks nice on You, which I enjoyed but many around me in the audience seemed confused by. To end the show Sufjan, alone on a darkened stage, fingerpicked his guitar and sang John Wayne Gacy, Jr. I heard people in the audience complain about the encore as they walked out. Most of them thought it was “weird” that he ended the concert with such a depressing song about killing people. Apparently these were fans that had never listened to Illinois in its entirety. I almost agree with them though. Rock and Roll tradition has certainly been to “rock the F out” on the final song and end with a bang. An encore of acoustic numbers felt kind of like an afterthought to satisfy the “old folks” in the audience who had expected to hear older material. 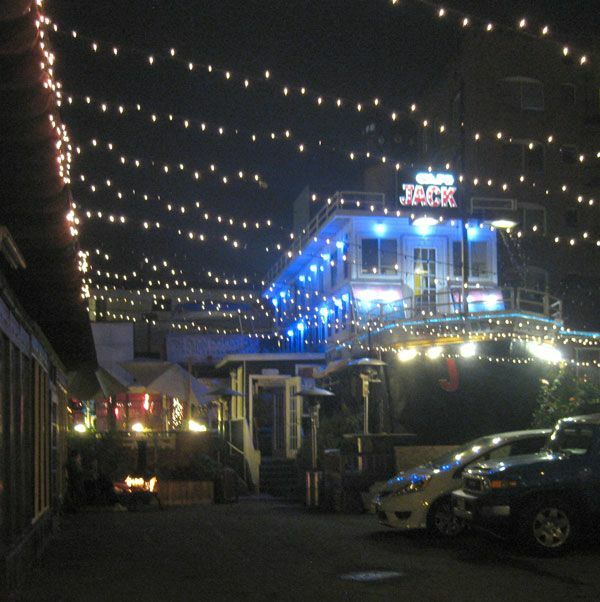 On the way to the car I noticed I’d parked right around the corner from Cafe Jack, which I’d always heard about but never seen: the coffee shop in a boat. On Sunday Sam and I went to the Melrose Trading Post to look for the “branch of life LA” booth that I blogged about after seeing on the Art Walk. We walked around the entire thing twice and couldn’t find it. We did, however, run into Sam’s coworkers who had a booth selling Halloween costumes there.